EUROPE: WindEurope believes institutional investors should look at hedging options in a bid to increase the value of their wind assets, according to a new report launched in association with insurance firm Swiss Re. 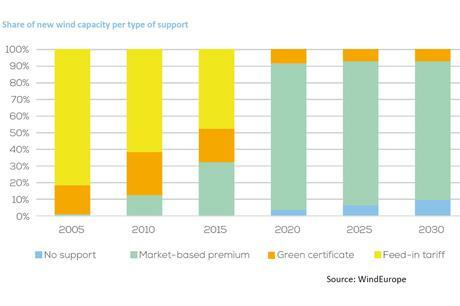 The Value of Hedging report, launched on the second day of the WindEurope conference and exhibition in Amsterdam (28-30 November), shows that by 2030, just 6% of the 323GW installed capacity in Europe will be protected from weather and price risks. This fall, down from 75% in 2017, is in response to policy frameworks moving away from feed-in premiums for generators. The increased risk to project revenue, should wind speeds fall in a given year, means institutional investors are wary of taking on wind sites that do not have that security. As an example, the report states an "average" 30MW onshore wind project would need to forecast a +/- 10% annual variation in production forecast. With this new report, WindEurope is highlighting the insurance options available to project owners to mitigate these risks. "By reducing the variability of the returns, cash flows move closer to the profile of a fixed-income investment, similar to a bond," WindEurope said. "The increased certainty improves the capital structure of projects by reducing their cost of capital. "Risk management services such as hedging could extract a value worth €2.5bn for new wind assets installed between 2017 and 2020. This may go up to €7.6 billion for new wind power installations between 2017 and 2030," the trade body added. Stuart Brown, head for origination weather and energy at Swiss RE Corporation Solutions, said at a conference side event: "If you take weather uncertainty, wind volume uncertainty out of the cash flows, you have smoother cash flows, the banks will lend you more of your development costs and that creates value because debt is cheaper than ownership and equity. "There are plenty of investors in wind who are perfectly comfortable with the uncertainty, a +/- 10% in a given year, they're used to that. "But as you get to ownership by infrastructure investors who like the long-term infrastructure ownership but need to pay out dividends steadily and have stakeholders who aren't so used to that risk, then it has value for existing assets as they come off tariff subsidies." Brown did admit that the increase of storage solutions in wind project would reduce the need to hedge the weather and price risk increasingly exposed to projects, but added it was "a threat that we're perfectly happy to see happen". "In a world where you can store wind power, when it comes, that's better than a financial hedge. "But we think there's some value to be added in the meantime," he concluded.